The Singapore state’s relationship with religion has been one of pragmatism, rooted in the realities of the country’s multi-racial and multi-religious society. This was clearly evident in the 1980s when Singapore was confronted with many challenging issues of morality and the practice of religion. On the one hand, the secular state viewed religion as a positive force in society and adopted a policy of neutrality and non-interference in matters of religion. On the other hand, it did not hesitate to intervene in the realm of religion when public order, security and economic survival were threatened. This is consistent with the view that to survive against the odds Singapore needs a strong, centralised government that subordinates all institutions, spiritual and temporal. The state’s intervention in the religious domain in the 1980s should be understood in the context of the government’s primary interest to ensure that society possessed the values that were necessary for economic progress and development. When increased religiosity and religious activism threatened social stability and encroached into the political space to challenge state sovereignty, the state moved to assert its authority to ensure that the practice of religion did not jeopardise the permanent interests of society (i.e. public order and long-term economic prosperity). The state’s exercise of authority could be justified by the social contract that citizens had presumably entered. The state’s assertion of authority was manifested in the late 1980s, which witnessed decisive action by the government to clarify the parameters of religion’s role in society. 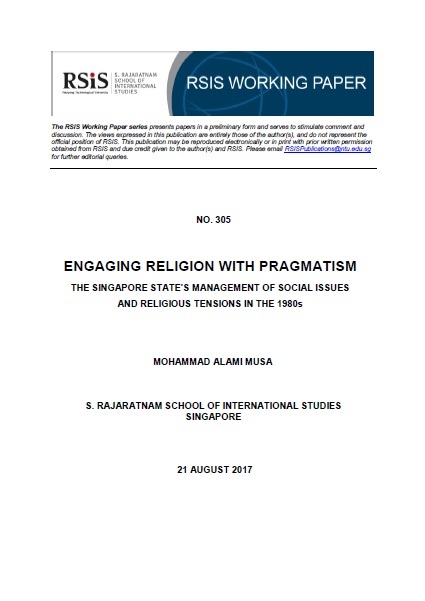 It led to the institutionalisation of principles of governance in managing religious life within a plural, secular Singapore. The state’s pragmatic approach in managing its relations with religion persists till today, giving space to religion generally but asserting its authority when the need to preserve social peace arises.